The aim of this Report is to profile, through targeted short descriptions, around 200 top Architectural Offices and about 100 Lighting Designers, both primarily specialised in the lighting category and that have not lighting as their primarily focus, but that engage frequently in designing luminaires. Where relevant, projects samples and co-operational activities have been highlighted. Mentioned companies are focused both on turnkey projects and small projects in the segments of hospitality (four and five stars hotels), luxury retail, office space, art & museums, high-end residential, entertainment. The Project Lighting market is estimated worth around USD 14 billion in the year 2015 and It is probably to reach USD 17 billion in 2020. It is a market where some hundreds of architectural practices and some 1,500 lighting designers play a relevant role as key influencers. Their aggregated turnover is around USD 1 billion. The Project business is pushed from many drivers: without ranking but just quoting some relevant issues we can mention the increasing importance of megacities, terziarization of the economies, LED innovation (OLED probably in the future), lighting controls. Talking about architectural companies, in a sample there is an average of around 400 employees in the American companies, 85-90 among the Europeans and 120-130 among the Asian companies. We do not include in this average a group of contracting projects also involved in the construction sectors (these have an overall employment of 1,000-3,500 people). 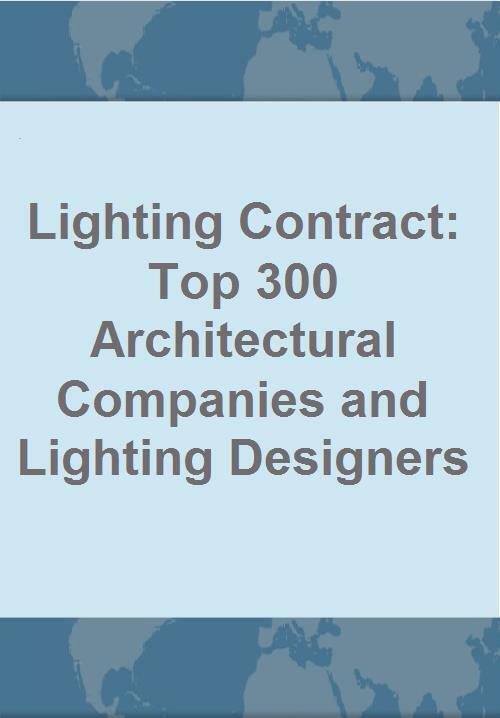 In the sample monitored in this Report, average is around 20 lighting designers and partners per practice in Europe, 18 in the United States and12 in Asia. 200 lighting manufacturers register contract sales for around USD 8 billion.